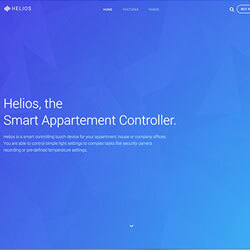 Helios Theme is packed to burst with useful features and neat little details. The Header position will automatically turn a widget/module that is published there into a fullscreen header. Additionally the theme offers a mouse following gradient stalker as an eye-catching effect. The main navigation features the option to apply a centered full width dropdown and can also be set fixed, so that it will remain at the top of the window while you scroll the site. All section blocks provide lots of options to further individualize your site. You can apply different backgrounds, textures, paddings and adjust the container width. To give you more flexibility, we also added a new panel and another subnav style. The 6 styles bring a lot of variety to the theme, changing between a more skeuomorphic to a completely flat design throughout the different presets. Of course, Helios also features a special blog style that uses the featured image with an overlay as a teaser for your articles.